Café Del Manolo: What can I can for the Can Jam? Last summer I was very intrigued by the prospect of making my own Jam and Pickles. I had never made my own, but I have many fond memories of my mother making preserves from her over abundant garden. Growing up we had great blackberry jams and canned peaches that barely lasted the winter because they were so good. Our first attempt started with a basic strawberry jam that involved the use of pectin, not something that my mother ever used but it was the first recipe we had. I wanted to find ways of not using additives to set the jam. Through a few google searches I came across Wellpreserved.ca and and I started to read the daily entries. And they lead me to Tigress in a Jam where I came across the project that I and about 134 others will be partaking in, once a month for rest of this year. You can read about it further by following the link in the sidebar button for Tigress' Can Jam. The theme for January is Citrus, and what will I be making? I'm not sure... I went to the market and I came back with the above haul, I wanted to taste 1 of each of the citrus they had in at the time. 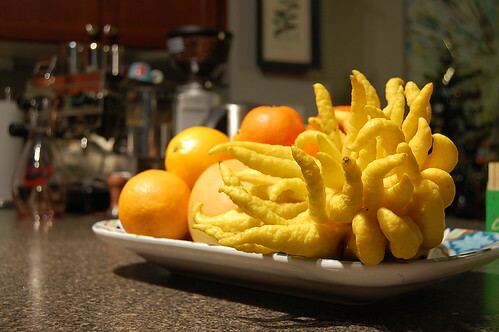 Cara Cara, Blood, Navel, Kumquats, Grapefruit, Clementine, Sunburst Tangerine, Satsuma Mandarin, Meyer Lemon, Minneola and my favorite odd ball of the bunch the Buddha's Hand Citron. I've also been flipping through my canning books trying to narrow down what I want to make and I keep coming back to one thing, a Traditional Marmalade. Figures that the one citrus fruit that wasn't at the shop or in season yet is a Seville Orange. I am going to have a fun time eating and using the various citrus that are stacked up in that bowl. Who knows...I may end up with a 12 citrus varietal blend of Marmalade! That's a pretty impressive haul! Where'd you get all that? I managed to find it all at Whole Foods here in Toronto. They had a few other citrus but I figured I already had enough in my cart! For thanks for the Twitter follow. I'm enjoying looking through your blog. This post picture showed a nice E61 grouphead machine in the background if I am right? Would be curious to hear more about your coffee preferences. No problem, I found your blog when I was looking for some cafe reviews, great info! I wish it was an e61, but it is actually a Pasquni Livia 90 that's about 10yrs old and my Mazzer Mini. I've been looking for more stuff to try out but have been mainly using Black Cat & Stumptown Hairbender for espresso. Every once in while I'll try some different stuff in Vac Pot.